In 2013, while working at GFRANQ photo service, I participated in the development of an eponymous web service for publishing and processing photos. Filters and transformations were defined in the file with parameters, and all processing was carried out on the server. During service development, there was a need to support these transformations on the client side for the preview. According to Larry Wall, one of the virtues of a programmer is laziness. Therefore, as truly lazy programmers, we thought about the possibility of using the same code on both the server and client sides. The entire development was conducted in C#. After researching the libraries and a couple of attempts, we proudly concluded that this was possible and began to write the universal code. Why is this article needed? Indeed, 6 years have passed since 2013, and many technologies have lost their relevance, for example, Script#. On the other hand, new ones have appeared. For example, Bridge.NET or Blazor based on the fancy WebAssembly. Nevertheless, some ideas can still be used. In this article I tried to describe them as detailed as possible. I hope that the mention of Silverlight and Flash will cause a smile with a hint of nostalgia, and not a desire to criticize the old solutions. Anyway, they have contributed to the development of the web industry. The challenge is to implement photo collage and filter-based photo editing functionality on the client-side and, if possible, on the server-side as well. 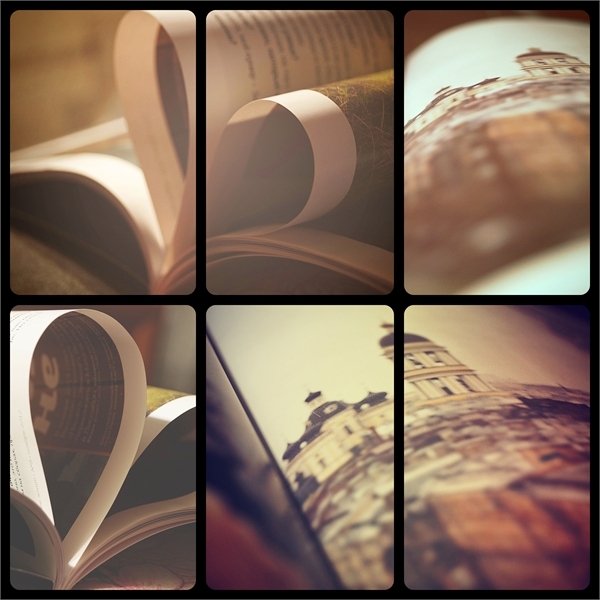 For a start, I will cover how filters and collages are implemented. Apart from editing a photo with a filter, we needed to crop and rotate the image. Yes, I knew that there are jQuery plugins to crop and rotate images, but they seemed to be overloaded and deviating from the universal architecture of the project. Collage feature implies using a simple format for storing rectangles with relative coordinates from 0 to 1, the addresses of photos, and image modification data. Relative coordinates are used because the same client-side transformations are applied to large size pictures on the server-side. For obvious reasons, Flash and HTML are the only technologies that deserve attention as the rest of them are not cross-platform compatible. Furthermore, the Silverlight client is beginning to die. Although I really like the concept of salt NaCl, unfortunately, this technology is supported only by Chrome browser and it is not yet known when it will be supported (and will it ever be supported) by other popular browsers. Note from 2019: it will and the name is WebAssembly. And some others available on GitHub. As a result, it was decided to use Script# due to the fact that JSIL works directly with assemblies and generates less pure code (though it supports a wider range of C# language features) and SharpKit is a commercial product. For a detailed comparison of these tools, see the question on stackoverflow. Of course, it is not limited to two platforms. As a followup it is planned to add support for WinPhone, and then, perhaps, Android and iOS. Using API functions (DrawImage, Arc, MoveTo, LineTo). High performance and support for hardware acceleration are important competitive advantages. The drawback is that they can be implemented differently on different platforms. Pixel by pixel. Support for implementation of any effects and cross-platform coverage are among the benefits. The disadvantage is low performance. However, you can mitigate the disadvantages by parallelization, shaders, and precalculated tables (we will discuss it further in the next section on optimization). 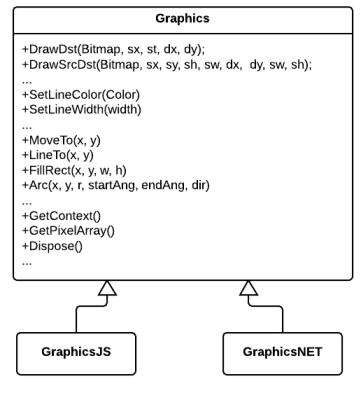 As you can see, the abstract class Graphics describes all methods for working with graphics; these methods are implemented for various platforms in the derived class. The following aliases were written to abstract from Bitmap and Canvas classes as well. The WinPhone version also uses an adapter pattern. The data array is subsequently used to implement various pixel by pixel operations (such as masking, fisheye, saturation adjustment, and so on), both parallelized and not. A separate project is added to the solution for each platform, but, of course, Mono, Script#, and even Silverlight can not refer to the usual .NET assemblies. Fortunately, Visual Studio has a mechanism for adding links to files, which allows you to reuse the same code in different projects. Compiler directives (DOTNET, SCRIPTSHARP) are defined in the project properties in Conditional Compilation Symbols. Please note that inclusion of any instance of a C# class, which implements the IDisposable interface, requires calling Dispose method or applying Using statement. In this project, these classes are Bitmap and Context. What I've said above is not just the theory, it actually has a practical application: Processing a large number of large size photos (up to 2400 x 2400 dpi) on ASP.NET Developer Server x86 resulted in out of memory exception. The issue was resolved after adding Dispose in the right places. Some other helpful advices on image manipulation are given in the following article 20 Image Resizing Pitfalls and .NET Memory Leak: To dispose or not to dispose, that's the 1 GB question. After all, lock should also be used when accessing the properties of a synchronized object (In fact, any properties are methods). To speed up the processing, all potentially used masks for filters are loaded into memory when the server starts. No matter what format the mask is, the Bitmap uploaded to the server uses 4 * 2400 * 2400 or ≈24 MB of memory (the maximum image size is 2400 * 2400; the number of bytes per pixel is 4). All masks for filters (≈30) and collages (40) will consume 1.5 GB — that's not quite a lot for the server; however, as the number of masks grows this amount may increase considerably. In the future, we will possibly use compression techniques for masks stored in memory (in .jpg and .png formats) followed by decompression when necessary. Actually, the size can be reduced up to 300 times. An additional advantage of this approach is that copying of the compressed images goes faster compared to large ones; thus, lock operation will take less time and threads will be blocked less often. Manual minification, which is performed at the generation stage using ScriptSharp. Automated minification, which is performed after the generation stage using external tools such as Google Closure Compiler, Yui and other tools. To shorten the names of methods, classes, and attributes we used this syntax prior to declaration of the above mentioned entities. Of course, there's no need to do that if you are working with methods that are called from external scripts and classes (public). Another disadvantage is that you need to keep an eye on such short names if they rename the method and field names (especially, overridden names in the child classes) because in this case Script# won't care about repetitive names. However, it won't allow duplicated classes. By the way, minification functionality for private and internal methods and fields was already added to the developed version of the Script#. Google's minification tool has several levels of compression: whitespace, simple, and advanced. We've chosen Simple level for the project; although, Advanced level allows us to achieve the maximum quality of compression, it requires code written in such a manner so that methods are accessible from outside the class. This minification was partially performed manually using Script#. In this project, we minified both scripts and filter description files. Setting the crossOrigin = '' attribute on the server-side. Adding a specific header to the HTTP package on the server-side. This technique allows you to add any feature to the object without compilation errors. Particularly, wheelDelta property is not implemented yet in ScriptSharp (at least in version 0.7.5). This property indicates the scroll wheel amount, which is used for creating collages. That's why it was implemented this way. Such a dirty hack with the properties is no good; normally, you need to make changes to the project. But just for the record, I haven't yet figured out a way to compile ScriptSharp from source. For more information about the Cross Origin Request Security visit http://enable-cors.org/. We used optimization for some operations such as brightness, contrast, and color curves adjustment via the preliminary calculation of the resulting color components (r, g, b) for all possible values and further use of the obtained arrays to change the colors of pixels directly. It should be noted that this kind of optimization is suitable only for operations in which the color of the resulting pixel is not affected by adjacent pixel. // Calculation of values for the first table. // Calculation of the resulting intermediate image. // Calculation of values for the second table. // Calculation of the resulting image. But even this is not all. If you have a look at the table on the right, you will notice that new arrays are created using Clone method. Actually, you can just change the pointers to the old and new arrays instead of copying the array itself (this recalls the analogy of double buffering). However, the number of calls of this function can be minimized. 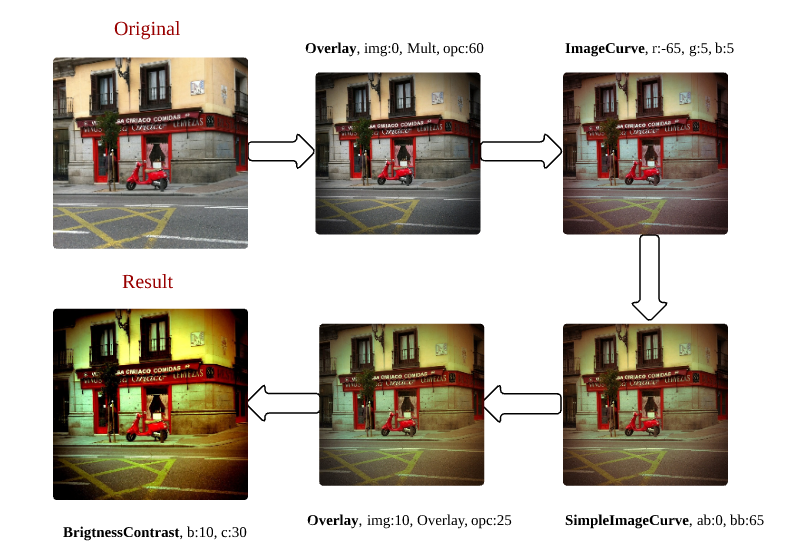 Namely, we can use the same array of pixels for pixel by pixel operations, by analogy with the previous optimization. In the examples below, I will provide the fragments of code that I found interesting and useful. To keep the article from being too long, I've hidden the examples under a spoiler. Please note that in html5 canvas images can be rotated 90 and 180 degrees only using matrices, while .NET provides enhanced functionality. Thus, an appropriate precise function for working with pixels was written. It is also worth noting that an any side 90-degree rotation in the .NET version may return incorrect results. Therefore, you need to create a new Bitmap after using the RotateFlip function. Note that in the Script# version we specify a different function CollageImageLoad, which is called after loading an image, whereas in the .NET version these processes take place simultaneously (from a file system or Internet). This function is used to determine drag & drop capabilities in different browsers. I've tried to use modernizr, but it returned that Safari and (in my case, it was a Win version) IE9 implement it. In practice, these browsers fail to implement drag & drop capabilities correctly. This code is used for a rectangle for cropping images. Thanks for the ideas to everyone who responded to this question on stackoverflow. setInterval function is used to implement image rotation animation. Note that the result image is calculated during the animation so that there are no lags at the end of the animation. For example, Bridge.NET or Blazor based on the fancy WebAssembly.